The Christmas Tree Farm is opening November 25th for the 2017 season. We are open Saturdays and Sundays only from 8:30am to 4pm. We have a great selection of Balsam Firs in all sizes. We also have hand made wreaths. 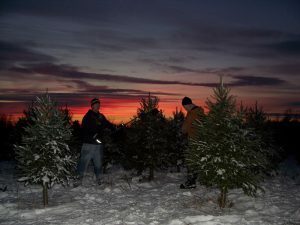 Come visit us on our hill side tree farm. Enjoy our friendly family atmosphere, and check out our beautiful Christmas trees and hand made wreaths. Like us on Facebook for pictures and more information on the farm. We are opening for the season on November 24 2018 and we will be open weekends only from 8:30 a.m. to 4:00 p.m. We will closing for the season on Sunday December 16th.